‘Peter Harrison is a rare gem of a chef – quiet, self-effacing and genuinely talented. His determination to work as a chef at an early age saw him write to twenty restaurants in the French Michelin Guide. He was eventually offered a job as the lowliest employee (an ‘estage’) at Marc Veyrats 3 star restuarant Auberge de L’Eridan in Annecy. On his one day off he worked at a local boulangerie and dedicated his time to learning everything and anything he could. In the 90s Peter worked for Alastair Little at his eponymous restaurant in Soho before becoming head chef at Sonny’s in Barnes. In 1998 Peter was lured away from the capital to a special and unique restaurant in the Suffolk countryside, The Leaping Hare near Bury St Edmunds. The wealth of local produce available opened up a whole new experience for him and he drew loyal customers to the restaurant from miles around. 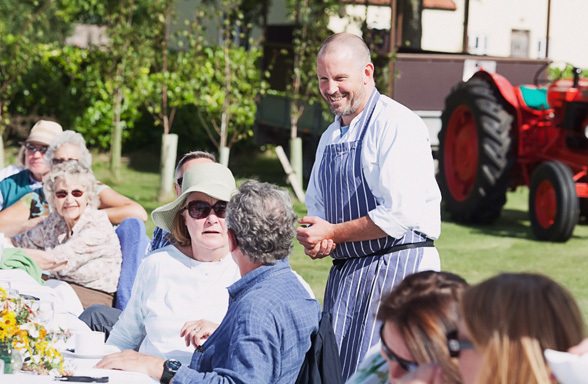 Two years later, Peter took the plunge and opened his own restaurant in Kelsale, Suffolk and straight away Harrison’s was an award-winning hit. The thatched, beamed building was crammed with diners for five years, before Peter decided to take a break and have family sabbatical in Australia.